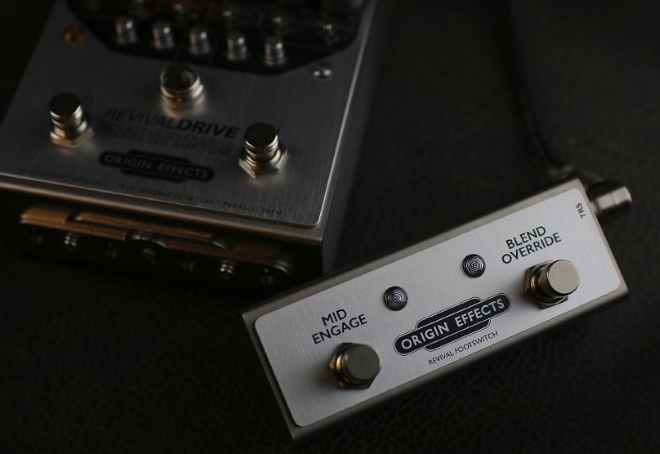 MID ENGAGE With the pedal’s MID ASSIGN switch set to F/SWITCH, this allows you to apply the adjustable mid boost to whichever channel is currently selected. Please note: the MID BOOST is applied to both the DRY and O.D. signals mixed by the BLEND control. The MID BOOST function is not active when the pedal is in BYPASS mode. DRY OVERRIDE This footswitch “overrides” or removes each channel’s BLEND control from the signal path. With the BLEND knob set for a mix of DRY and O.D. signals, engaging the DRY OVERRIDE effectively removes the DRY component and reverts to a 100% O.D. signal. This offers additional flexibility akin to having another channel on your amp. For example, with the channel controls set for medium gain and the BLEND knob at 12 o’clock, engaging the DRY OVERRIDE footswitch lets you go from an organic clean tone with a little grit to a fully overdriven sound for solos. By carefully adjusting the DRY GAIN trimmer, you can control the change in volume – up, down or unity gain – that occurs when engaging DRY OVERRIDE. For example, you could set up your core drive tone with DRY OVERRIDE engaged, then transition to a cleaner sound of equal or greater volume by disengaging DRY OVERRIDE and turning the DRY GAIN control up.